I can tell you now about the wisdom of training on only 4 miles a day for a marathon. More specifically, I can tell you what has more impact, gaining ten pounds or dropping in altitude from 5280 feet to 550. Gaining 10 pounds. I’ll expand on that topic a bit later. 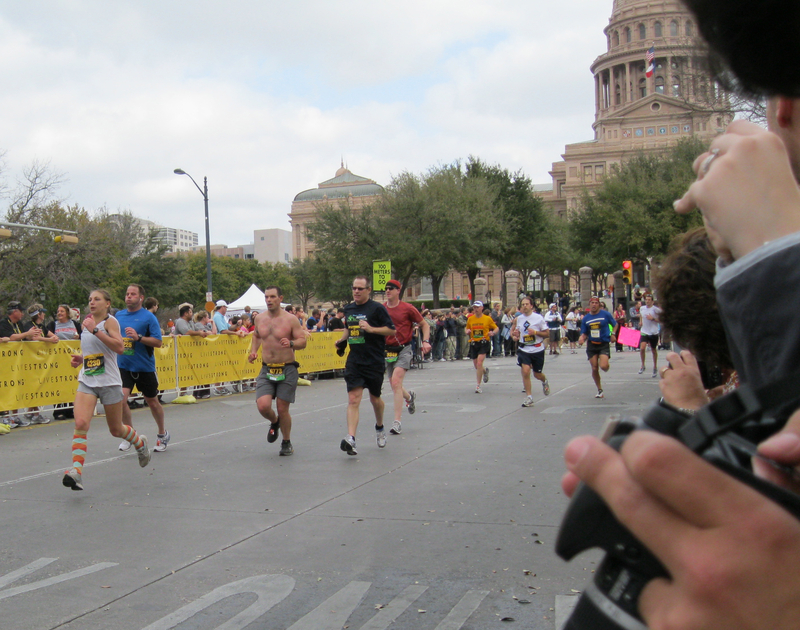 This pic was taken by my brother Steve in the final 100 meters on Congress Avenue. Fortunately he can’t figure out the video on his camera so you can’t see that the other runners in this pic were all passing me. I’m back at my mom’s house, showered and blogging with a Miller Lite by my side. I’ve got about an hour before I meet up with some high school friends at Chuys. This run started at 7am on Congress Avenue a block north of the Texas Capitol and proceeded north a few blocks toward the UT campus. The darkness of night may have faded, but it was hard to tell with the thick overcast. The weather was awesome. Drizzle was projected but never materialized. It wasn’t cold though and I wore Nike Dri-FIT® runners shorts and my Denver Marathon short-sleeve shirt with hi-tech fabric. I also wore my black Barr Camp runners hat but carried it the second half of the race as the sun never came out. I launched a 17 hour playlist from my iPhone in shuffle mode. I love the random nature of my 17 hour universe when just the right song comes on as I need it. Dream On by Aerosmith led today’s charge. I was huddled in a scrum with the 3:30 pace runners. I actually hung with them for 10 miles or so. That might have been too fast. The street was crowded and didn’t start to yield room until crossing the Congress Avenue bridge after a couple of miles. Lance Armstrong was larger than life on an electronic billboard at the end of the bridge looking down approvingly at us all like some brew pub deity commanding us to drink Michelob Ultra. The race blogs I read to understand the course weren’t downplaying the hills. This little run didn’t shy away from elevated terrain. We climbed up South Congress Avenue for 5 miles non-stop. 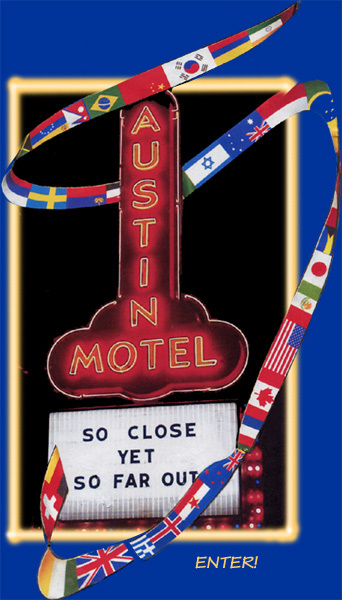 My crowd of runners got a kick out of the Austin Motel sign after 3 miles. This phallic signage stood erect as if to point the way “up” South Congress. Other signs were notable. My favorite was around 18 miles where some young woman held a large white poster board in front of her body. Above the sign were bare shoulders and below the sign were her bare thighs and feet. The sign read, “I’m naked behind this sign”. There were lots of runners looking over their shoulder as they strode past. Speaking of women, I absolutely love that sporty look of braided pig tails and ponies with fitted running outfits. Austin has some real beauties. I also read a number of references to the great Austin crowds in some blogs. Wow, I can’t say enough. I was truly impressed by the number of supporters out on the streets. Reminded me of my early days running the Capitol 10,000. They would read the names on the race bibs and call them out for a personal touch. It might have been the difference between me finishing and still lying out there somewhere in a gutter. This run was hard for me. At 12 miles or so the course split for the half marathoners to head back toward downtown. If they allowed last minute decisions, I’d have turned for the shorter run then and there. I was feeling beat and knew then that I wasn’t in shape for the full marathon. It’s a fair argument to state I wasn’t in shape for the half. My legs didn’t have the strength for this distance. They totally melted. I felt fine otherwise. The hills didn’t bother me until after 11 miles. My feet hurt like hell. Talk about inexperience. While my shoes were not new, I hadn’t been running in them much because they needed inserts to protect my left foot from over-pronating. I was busy with travel for work this week and didn’t have a chance to run in them after buying inserts. My feet felt like they were in a vise, but loosening them didn’t help. I didn’t get any blisters on my hills or arches, but did get one on a toe. But they just hurt. Running through the old Austin neighborhoods was special. Each neighborhood reminded me of some old girlfriend or date. But the ravages of age kept me from remembering any of their names. Running through the last neighborhood I lived in before moving to Boulder was pretty cool. And the bonus was that Hyde Park was nearing the finish. I knew at this point I’d make it. The Hyde Park Bar & Grill was around the 24 mile point. I’d been walking at each aid station to drink water since mile 16. I’d let the 3:30 mile pace group go long ago and had since been passed by the 4 hour pace group. I wasn’t too disappointed even though I’d expected to finish in 4 hours. I was just focused on finishing. I’d accomplished my goal of using this to keep myself motivated through the winter and this was good for that. This run has also been good for meeting up with old friends. Nancy Wilson Basey met my brother and me for lunch at Kerbey Lane off 38th Street. She looked as good as ever and made me feel pretty good that she went out of her way to see me. We hadn’t seen each other in 30 years. And I’m meeting up with some other friends from my RRHS Cross Country team in 30 minutes at Chuys. Toby Thurman and Bill Hay. That’ll be a trip. I come down to Austin every Christmas but don’t generally meet up with old friends because I focus on family. Time to publish this and head over for a frozen rita. Great job Ed, my knees ache just thinking about it. Maybe a blog post with a sampling from your 17-hour music playlist? That has GOT to be eclectic. Good job! What was your time? How many marathons is that for you? Tough accomplishment considering your training. My time was around 4:25 – not really sure. For some reason I’m not in the results. Not even with a DNF, but the web site says results are still unofficial so I guess they are still tabulating. And I wasn’t paying too much attention to the finish clock. Reading the paper this morning, it appears the strong wind cased the race leaders to be about 10 minutes slower than last year. When you’re running slow to begin with, you don’t notice the wind. I thought it was nice as it kept me cool. This marks my 4th lifetime marathon. One at 16, another at 18, then two in the last 4 months at 48. I feel pretty good today; running slower has benefits. Enjoyed your blog about your experience in the Austin Marathon. Congratulations on your very good effort. I was surprised there wasn’t some kind of crazy weather….or rain. Glad it held off for you faithful runners! I’m sure the time w/ high school buds was a finishing treat. Great job….congrats again! Keep running and blogging about it.